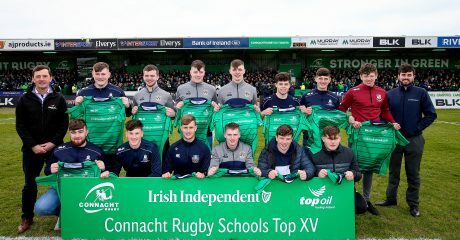 Players and spectators alike couldn’t have wished for better conditions in which to contest this Top Oil Schools Junior Cup decider in the Sportsground, with blue skies overhead and dry turf underfoot. 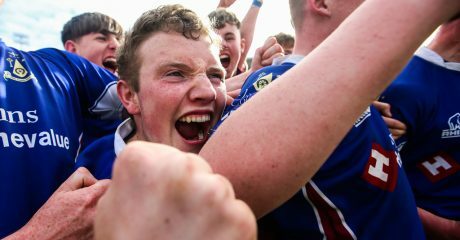 In the end it was the Marist College of Athlone who emerged victorious, but only after a thorough examination of their credentials by a gutsy Garbally side. Eight minutes had elapsed before Garbally struck for the first try of the game. 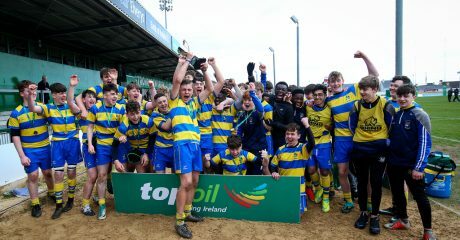 The Ballinasloe school, who were hoping to win the first leg of a Junior-Senior double on the day, pounced on a Marist turnover high up the field and John Devine and Tom Fitzpatrick combined to put Naoise Murphy away in the corner. But Marist were gradually beginning to establish some dominance in the tight exchanges and Garbally were forced to make some last-ditch tackles to deny the Athlone students a levelling score, full-back Ger Colleran in particular taking up some excellent defensive positions. The pressure eventually told and Marist were back in contention on 16 minutes. A period of sustained pressure on the Garbally line ended with openside Sam Fogarty reaching out and slamming the ball down on the whitewash to draw his team level. Full-back Ruaidhri Fallon added the extras and Marist had the lead. They extended it five minutes later when Ben O’Carroll put Tom Shine clear in the outside right channel, the centre finishing the move clinically to make it 12-5. They were in again in the last of the half’s 30 minutes, after O’Carroll turned Garbally’s defence around with an intelligent crossfield kick and John Dylan O’Shea poached the ball brilliantly. Kieran Egan crossed over moments later to leave it 17-5 to Marist at the break. 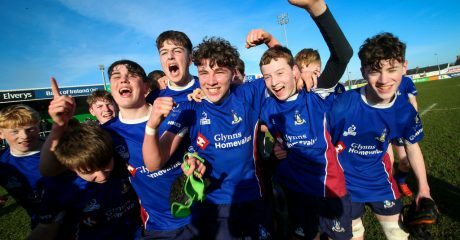 Garbally came out after the break and planted themselves deep in Marist territory in search of a try to bring them back into the game but the Athlone boys were resolute in the way they protected their line. Garbally battered away at the door for the entire third quarter until a crack finally appeared in the 46th minute. Out-half John Devine made the initial break before Gavin Daly burst through a hole in the retreating Marist line to dive in under the posts. Matthew Devine’s conversion cut the deficit back to five points. But Marist hit right back with a penalty that ultimately proved crucial. Fallon opted to go for the sticks after Garbally were penalised for offside and his effort found the target to stretch the lead to eight. The closing minutes were hugely dramatic and tense, especially once Garbally crossed again to cut the deficit to three. With Marist a man down after winger Aaron Burke was sin-binned for a deliberate knock-on, Garbally went over in the corner through Tom Fitzpatrick, though Devine was wide with the tricky conversion. Garbally threw everything forward at the death but Marist weren’t going to be denied. They held on to win their second Junior Cup in three years and their seventh overall. 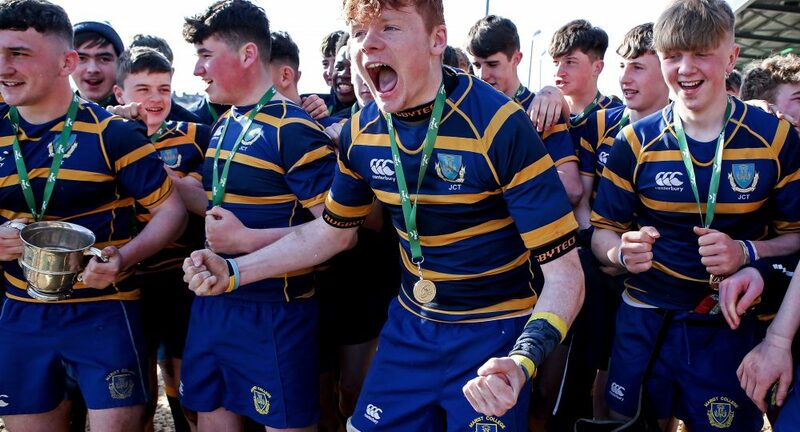 MARIST: Ruaidhri Fallon, Adam Donovan, Eamon Martin, Tom Shine, Aaron Burke, Ben O’Carroll, Adam Flanagan; Hugh Cunniffe, Koronato Kiripati, Kieran Egan, Martin O’Grady, John Dylan O’Shea, Gavin Daly, Sam Fogarty, Diarmuid Carey. GARBALLY: Ger Colleran, Naoise Murphy, Tom Fitzpatrick, Conor Goode, Kealan Kenny, John Devine, Matthew Devine; Joey Carry, Adam Dowd, Matthew Kelly, Oisin Carroll, Brian Feeney, John Claffey, Kyle Blackweir, Mark Mitchell.